K&A Manager Mark Evans has arranged for a skip for Friday 27th May at Dundas. The skip will be left there for the weekend. Michelle Smith, a continuous liveaboard on the the Kennet and Avon, has launched The Liveaboards Cut, a new magazine featuring and celebrating life on the Western Kennet and Avon. 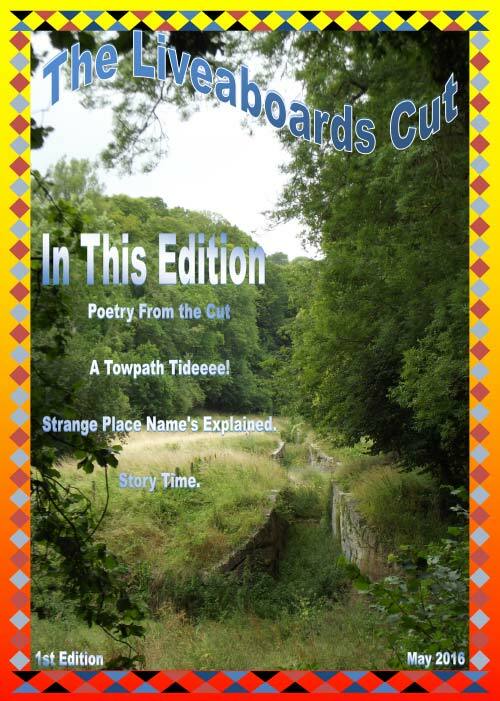 The first issue, out now, focusses on many of the traders on the cut as well as a feature on The Travelling Community Support Service and some of the lighter side of life aboard with poetry, humour and stories. Well worth a read. And if you wish to contribute, Michelle is looking for contributions for the next issue. The Liveaboards Cut is a quarterly publication. You can download the first issue as a PDF here. K&A Manager Mark Evans would like to know where and when boaters would like CRT to put a skip for boaters’ larger items of rubbish, such as boat interiors or old deck boards and rubbish collected from towpath tidy days. The K&A Users Forum will take place in the Corn Exchange, Market Place, Devizes SN10 1HS on Tuesday 24th May 2016 at 6.30pm to 8.30pm (doors open 6pm). This is an open meeting and all waterway users are invited. This week we reported that Matthew Symonds was heard to say, twice, that liveaboard boaters were “gits”. Since we reported this, someone on Twitter asked Mr Symonds if the comments he had made were true. He categorically denied that he would ever say such a thing. Matthew Symonds, subject of an allegation that he referred twice to liveaboard boaters as gits has cut his holiday in Holland short to publish this, official, rebuttal. Yes, I remember you, the good work that you were involved in at the Bristol Wood Recycling project in Bristol and the brief time we met outside the Southville Centre when you and my former colleagues were attending the training session there, but that’s where our memories start to differ I’m afraid. Speculation has been mounting about whether Matthew would do the honourable thing and ‘fess up or entrench himself and call his former colleague a lair. It seems now it is the latter. The non-seqitur seems a little strange to our ears. You meet a bunch of old colleagues and say “living on the canals can be a great lifestyle but it’s important to be aware what is involved”. Sounds more like his standard press statement than a casual response to “How’s the new job”. But he asked us to print his rebuttal so we leave you to draw your own conclusions in this ‘her word against mine’ Mexican standoff. You are currently browsing the Kennet and Avon Boating Community Website archives for May 2016.